The harmful effects of sugar aren’t exactly a secret. Even the media has jumped on ship, reminding us of the damage it does to our bodies. Sugar is loaded with empty calories that carry zero nutritional value. It causes digestive distress and weakens our immune systems. Making it almost impossible to lose any weight! It’s pretty cut and clear. If you’re trying to slim down, you have to cut the sugar out of your diet. But if you’re one of the people who constantly have a “sweet tooth”, then that’s definitely easier said than done. These artificial sweeteners come with their own share of problems. First, the jury is still out on their long-term safety. While the companies that sell these products are quick to point out studies showing them to be safe, they often leave out the ones showing their dangers. For example, one study has shown that Sucralose (the sweetener used in Splenda) can cause lesions in our liver and kidneys. It can cause intestinal problems by altering the pH levels of the body. It has also been linked to trigger migraine headaches. When you consider these potential side effects, it doesn’t exactly seem like the “healthy” alternative to sugar it’s marketed as, now does it? And these are just the health concerns. 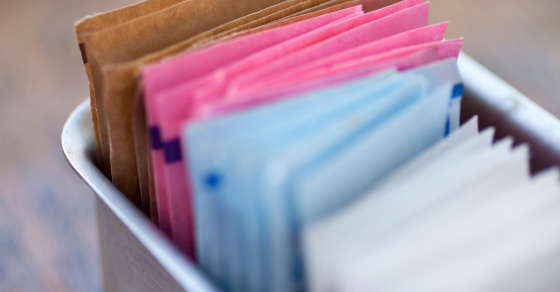 Artificial sweeteners trick our bodies with their sweet taste. When we consume them, signals are sent to our brain… letting it know that sugar is on the way. Our brain then sends this signal out of the rest of our body, preparing it for the “sugar rush” it expects. But since these sweeteners aren’t real sugar, we never feel that rush. We’re left with strong cravings for the sugar we’ve never received. These cravings can be unbearable and cause us to binge on sweet foods… a recipe for disaster when trying to eat healthy. Do we have to give up all sweet foods? We just need to use healthy natural ways to satisfy our sweet tooth. One way is by using natural sweeteners such as Stevia, honey, or dehydrated maple flakes. These low-calorie sweeteners don’t cause the massive insulin spikes associated with regular sugar. They also have various health benefits. Another way… is by simply incorporating some delicious fruit into your diet. Sure, fruit contains sugar too. But those natural sugars come with vitamins and minerals that provide nourishment for our body. By sticking to natural sources, you’re able to enjoy something sweet every day without sabotaging your weight loss goals. The key is to use moderation. You don’t want to over-eat these sweet foods. Because then the calories start adding up and you find yourself packing on the pounds. you first have to reprogram your mind! Trust me, it’s something I know all about. For years, I struggled with cravings that kept me overweight. It’s a proven method that instantly shuts down all unhealthy cravings. Just by making one simple tweak, you’re able to lose twice the amount of fat… by doing the same things you’re already doing. This is what makes Mind-Body Merging the most powerful fat loss technique on the planet. You can watch it right now. And within minutes, you’ll know exactly how you can use it to melt all your unwanted pounds and inches. In that video, you’ll also discover the one time you should actually eat sugar… if you want to burn more fat! I know, it’s hard to believe… but when you discover the reason, it will make sense, I promise! I won’t be able to keep this video up for long. So if you want to learn the most powerful fat loss secrets ever revealed, you should watch this short video right now while you still have the chance. It truly has the power to change your life.